I think I might be suffering from a tad case of sweater burn out. I’ve finished the right side panel and am now working on the back. More stitches means more time. My teacher Gail did warn us of this, though. Still, I’m chugging away. Perseverance! I did take a little time out this past weekend to knit a small birthday gift, so that put me back a little further, but only by a day, really. 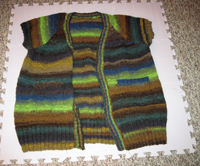 I want to have all the pieces knit by October 15, the next class. I think I can do it. I also didn’t get as much done as I like as life has been pretty busy lately and looks like the trend is going to continue onto this week, as well. Anyway, here’s what I have done of the back thus far. 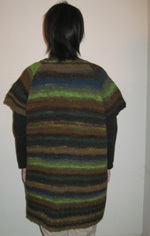 You can really see the striping of the Noro here. I like it! Here’s my progress on Week 2 of the Long Lean Sweater! I’m very happy with how far I’ve gotten on this sweater. Yeah, I’ve had to rip out on section on the left side TWICE, but I managed to do it without freaking out. Whew! During the second week, I’m working on the right side. I all I have to do is the raglan and neck shaping, and I hope to have that done tonight or tomorrow. Plans may change, frogging may occur, who knows, but that’s my goal. I have two weeks until my next class, but I’m going to keep on chugging away. One thing that did throw my off last night was the obscure abbreviation of p2togtbl. Eh? I did figure it out to be “purl two stitches together through the back loop.” Ah, ok. After a few tries, I think I got it. It has to be the most awkward decrease, but it does the trick. I understand it is mostly used in lace knitting and is even rare to come across then. If you are curious as to how to do it, I recommend checking this out. I’m working on my first sweater, and think it would be a fun to share my progress here on the blog. I’m currently in the first week of knitting, and have made good progress since my first class at Kitnit Fine Yarns, my LYS, on Saturday. 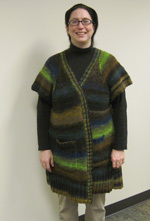 The pattern is what we are calling the Long Lean Sweater from the Noro Catwalk 2 book by Jenny Watson Designs. 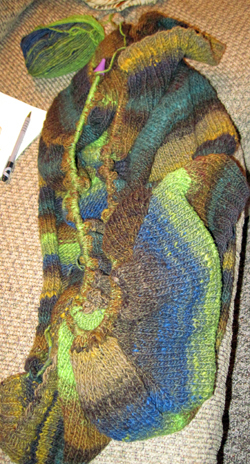 I’m knitting it in Noro Kureyon. 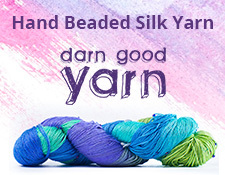 I love the character and colorways in Noro. As l leaf though this particular book, I am interested in knitting more out of it. 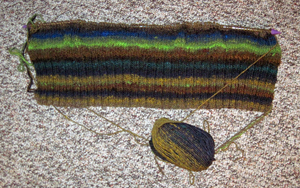 Of course, the first thing you do is knit a gauge swatch, but we are also using our swatches as pocket linings. 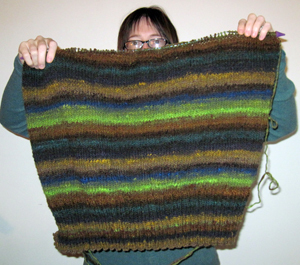 No frogging the swatch! I made two liners for the two pockets. 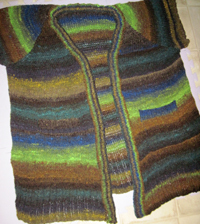 The target of the week is to finish the right front of the sweater. 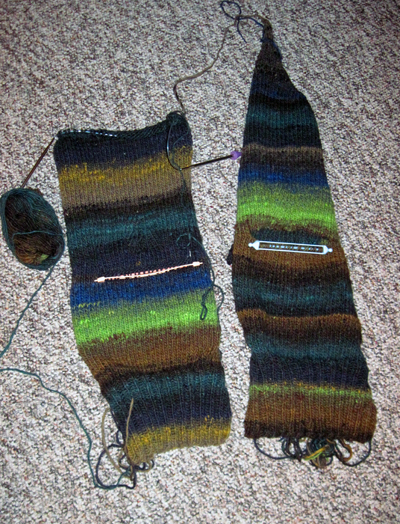 So far, I have the all the ribbing done at the bottom and am starting on the regular stockinette stitch for the rest. I’m proud of myself on this particular part as I navigated a confusing line of the pattern that was riddled with parentheses and brackets. And I managed to come out correctly in the row of knitting on the first try. YES!